The Tizen Developer Conference (TDC) 2017 is officially underway at San Francisco’s Hilton Union Square Hotel, where developers and device manufacturers from around the world have gathered to explore the many ways that the Tizen ecosystem is fostering exciting IoT innovations. 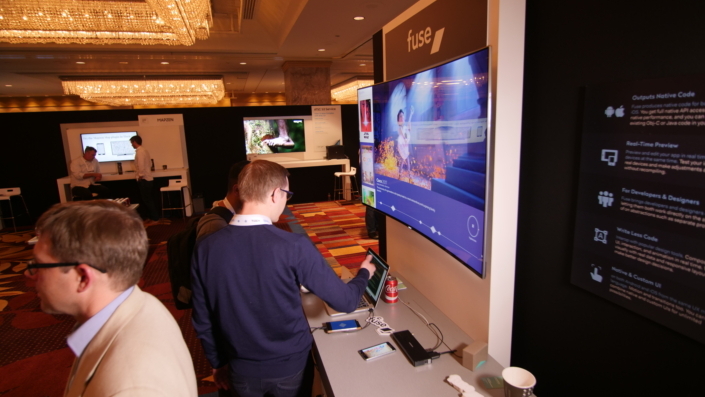 The interactive event offers attendees up-close looks at convenient Tizen-based products made possible through collaboration with innovative partners from around the globe. 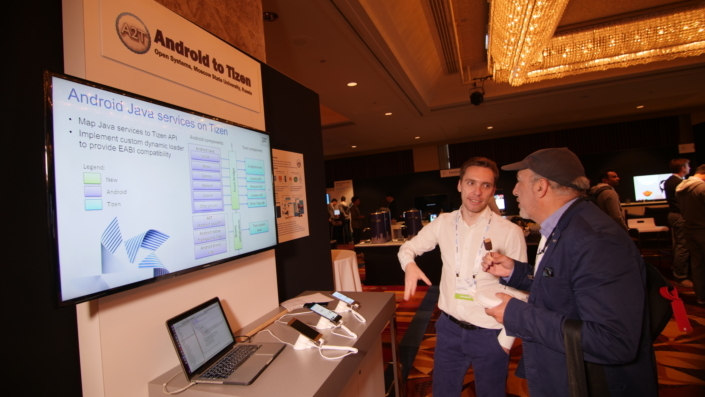 Among the showcased innovations are solutions that allow more businesses and users to streamline connections in their work and daily life, and make it easier for developers to innovate within the Tizen ecosystem. Check out some of the seamless products and solutions for yourself in the photos below. 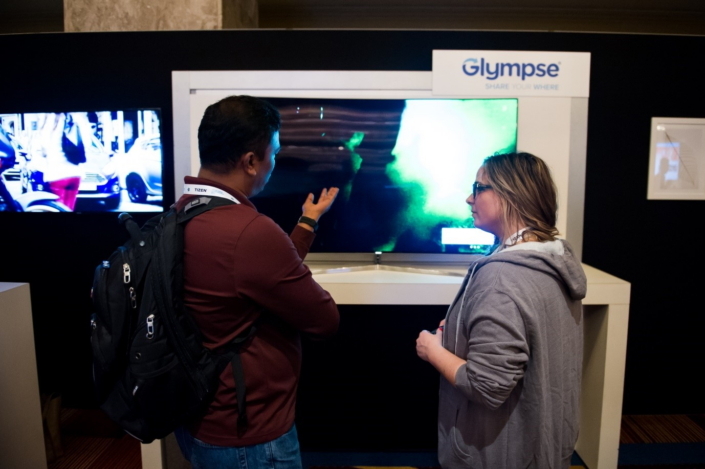 Attendees view a demonstration of location sharing platform Glympse’s Family Map service, which allows users to seamlessly share their location using a variety of devices within the Tizen ecosystem, including Samsung’s Gear S3 and Family Hub refrigerator. A display demonstrates how the workflow of the You.i Engine app platform makes it easy to port comprehensive C++ based apps onto Tizen TV apps using NaCl (Native Client). 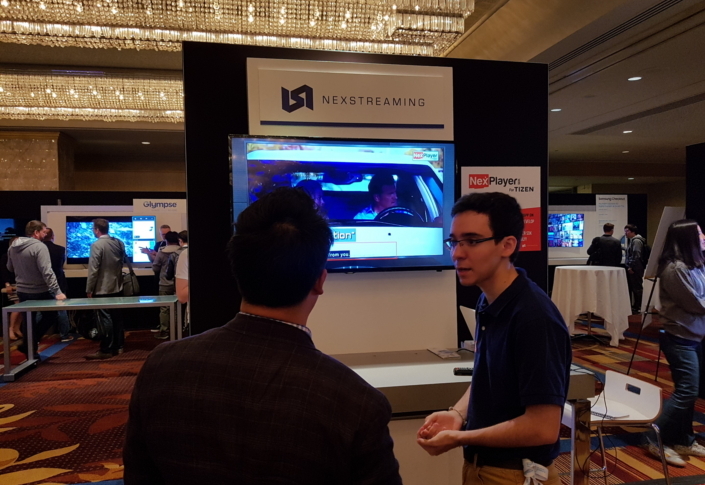 Attendees view a video that’s been optimized for Smart TVs with NexStreaming‘s NexPlayer for Tizen, a video player SDK for Tizen-based apps that offers video service providers advanced playback and customization tools. New Cloud Technologies’ comprehensive, Tizen-based MyOffice/Collabio productivity suite features apps that allow users to access and share documents, edit text and spreadsheets, view presentations and manage emails. 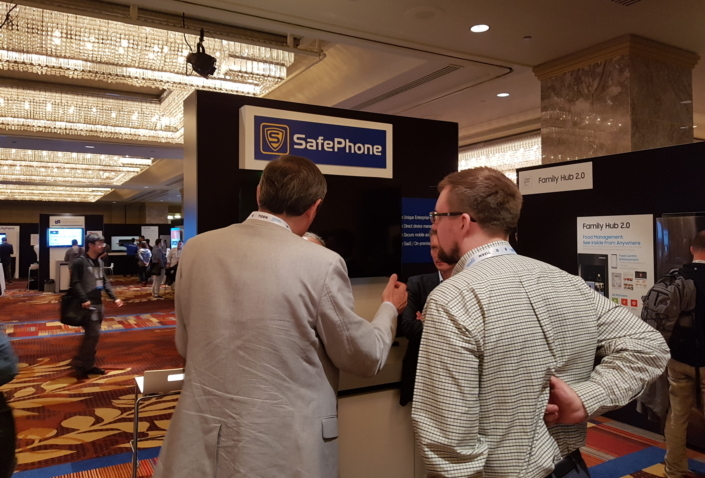 NIISOKB‘s SafePhone is a mobile device management solution that allows administrators to lock and unlock devices remotely, send secure messages, and manage applications, including browsers and cameras. 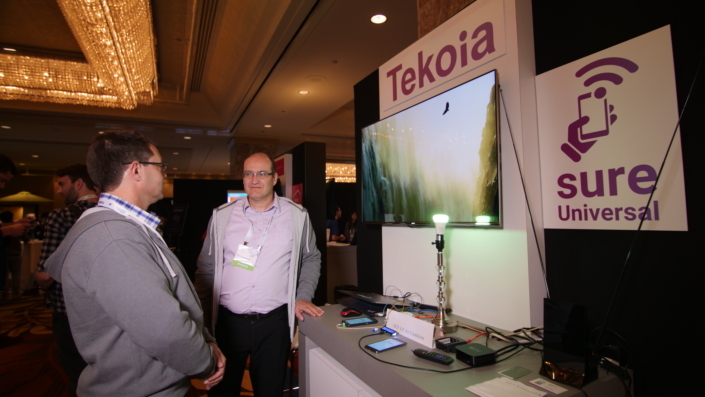 The exhibit for Tekoia’s OCF (Open Connectivity Foundation) certified ‘SURE Universal Remote’ app demonstrates its ability to seamlessly manage OCF-compliant devices through an Android mobile phone. 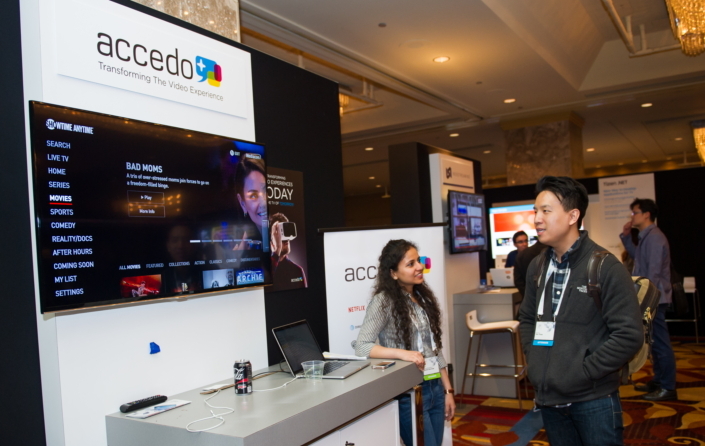 Accedo’s exhibit showcases its framework for deploying apps on top of the Tizen SDK and focuses on the ‘10-foot UX’, which considers the user’s experience viewing a smart TV from a 10-foot distance. 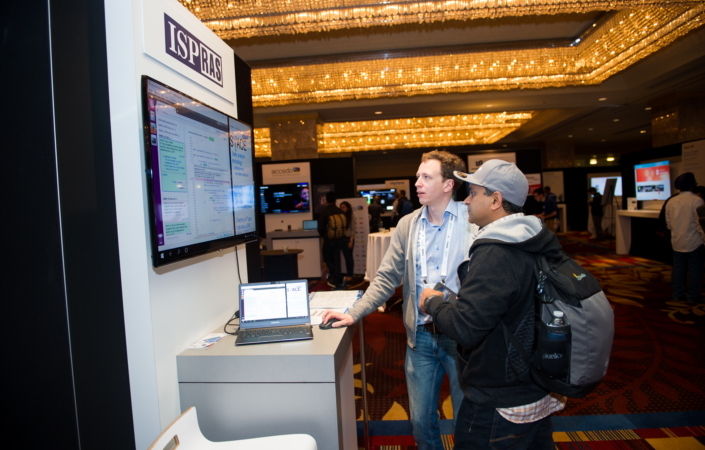 The Institute for System Programming of the Russian Academy of Sciences (ISP RAS), a research organization that specializes in system programming, showcases how the Svace static analysis tool may be used to check Tizen codes for defects and potential vulnerabilities. 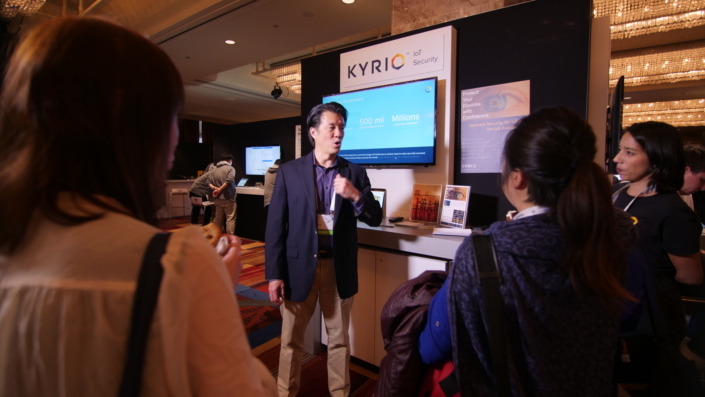 Kyrio Security Services, a cyber security provider trusted by some of the largest device networks in the world, outlines its efforts to make device manufacturers’ IoT security implementations simple, strong and effective. Optimized for Tizen-based smartphones, Android to Tizen’s (A2T) Wish mobile app makes it easy to browse a worldwide selection of trending fashion, electronics and more, and facilitates simple and secure purchases. 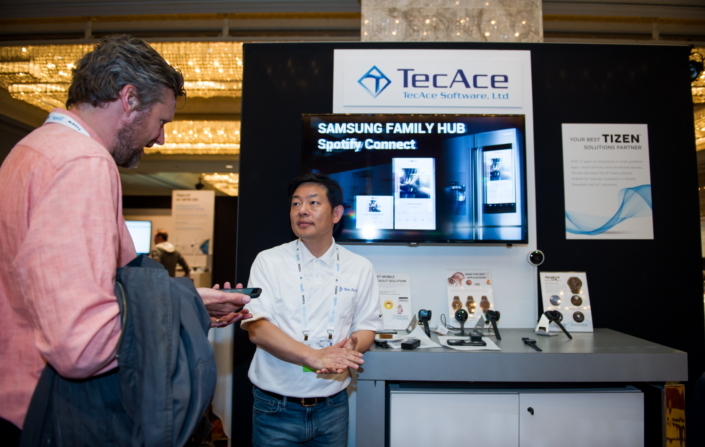 TecAce’s exhibit features demonstrations of B2C and B2B apps designed for Tizen wearables. Showcased apps include Gear For Nest, a connected-home application that allows users to conveniently control their Nest Learning Thermostat and Nest Cam security camera via their Gear S3, as well as Retail Checkout, a smart mobile checkout solution that utilizes a Gear device and a handheld barcode scanner.